A commercially placed song, known as a “sync”, is an increasingly legitimate way for musicians to make a buck in an i ndustry where sources of cold hard cash, at least for artists, is scarcer than ever. The success of the Honda sync was surprising though because the track that so enraptured viewers was Walking on a Dream by Australian pop duo Empire of the Sun, and it is eight years old. The song’s Shazam tags exploded after the ad’s release, as did its digital downloads and streams. In May, the band re-released Walking on a Dream in the United States and it hit number one on the Billboard dance songs chart. 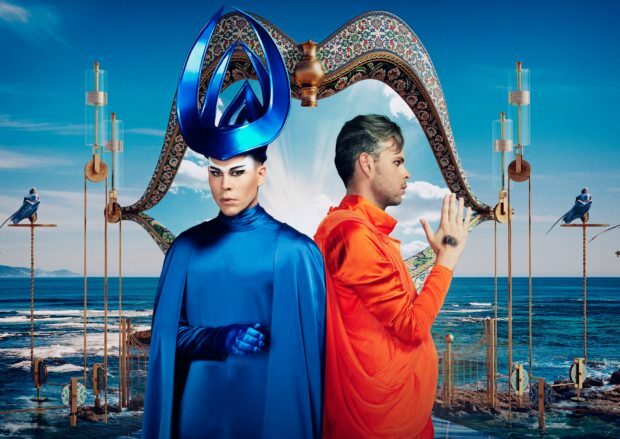 When I speak to Empire of the Sun co-writer and producer Nick Littlemore, on his promotional tour for their new album, Two Vines, the 2008 song has just sold one million copies in the US, qualifying it as platinum. Littlemore’s hair is silver now but his face is childlike. His manner is calm and open, verging on guileless. Conversation circles pleasantly but persistently back to his favoured topics of nature, hallucinogens, dream states and plant wisdom. You suspect he really does believe his band’s success is the result of happy thoughts in bottles. Both Littlemore and singer Luke Steele are based in Los Angeles. In December, Steele will don the duo’s outlandish costumes and begin touring. Littlemore won’t be joining him – he never has. How to rectify a lacklustre second album? Make the third blindingly bright. On Two Vines, Empire of the Sun return to the form of their first album, continuing their voyage out to strange new worlds. Visually and conceptually, that is. Musically, it is neither strange nor new: shimmery and trebly with beats that flutter and pulse instead of pound. On some tracks Steele’s voice is robotic with autotune and in photos the duo has retreated even further into airbrushed artificiality. That message is about nature. “Welcome to the garden of unearthly bliss,” opens the press release. “Through the waterfall of dreams, beyond the white light of the ice curtain lies a lush, green world where childlike innocence and ancient wisdom are one. Enter, Empyrean pilgrims”. It was fans who named themselves “Empyrean pilgrims”, Littlemore clarifies. As for the rest of the delusional high drama – such as appointing Steele ‘Emperor’ and Littlemore ‘Prophet’ – he says it was “initially a reaction against the ‘stare at my shoes’ generation”. Then it gathered steam.